ALERT TO MEDIA: Coverage is invited. 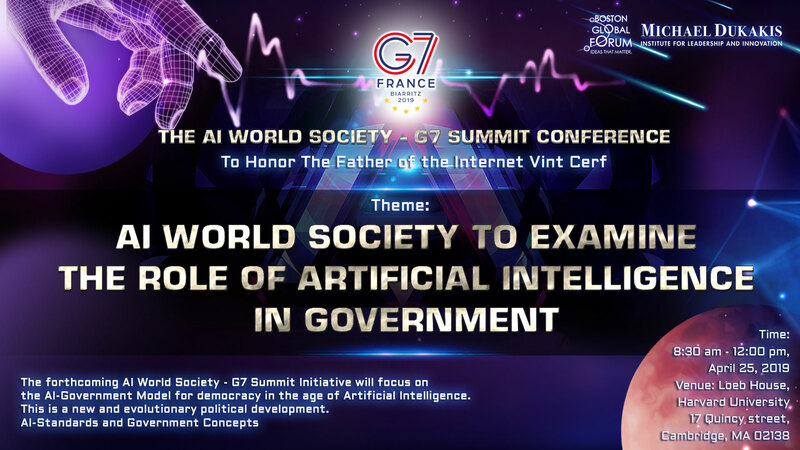 AI World Society (AIWS) will host Vinton Cerf, a Father of the Internet, as part of its commitment to offer fresh ideas from the world’s most brilliant minds to the next G7 Summit to be held in Biarritz, Nouvelle-Aquitaine, France. According to his biography by the Internet Hall of Fame Vinton G. Cerf, codesigned the TCP/IP protocols and architecture of the Internet, and once served as Chairman of Internet Corporation for Assigned Names and Numbers (ICANN). Also, as vice president and chief Internet evangelist for Google since 2005, he is responsible for identifying new enabling technologies to support the development of advanced, Internet-based products and services from Google and is a public face for Google in the Internet world. Cerf is the former senior vice president of Technology Strategy for MCI, where he helped guide corporate strategy development from the technical perspective. Previously, Cerf served as MCI’s senior vice president of Architecture and Technology, leading a team of architects and engineers to design advanced networking frameworks including Internet-based solutions for delivering a combination of data, information, voice and video services for business and consumer use. Arnaud Mentré, Consul General of France in Boston The French Perspective on Artificial Intelligence and the G7 Summit, which will be held in France on August 25–27, 2019. Paul Nemitz: Legal Concepts for AI – Layer 4 of AI World Society. AI WORLD SOCIETY (AIWS) was created by The Boston Global Forum (BGF) to examine issues and developments centering on the role of AI in society. The Boston Global Forum (BGF) is a not-for-profit think tank based in Boston, Massachusetts. Its mission is to bring together, in an open and accessible public forum, an eclectic and engaging spectrum of esteemed academic leaders, real-world experts, thought leaders, media experts and promising young leaders, who are dedicated to seeking peaceful solutions to the most contentious issues of our times. An offshoot of The Boston Global Forum, The Michael Dukakis Institute for Leadership and Innovation (MDI) was born in 2015 with the mission of generating ideas, creating solutions, and deploying initiatives to solve global issues, especially focused on Cybersecurity and Artificial Intelligence. Further details are available by contacting Mr. Tuan Anh Nguyen, Co-founder and Chief Executive Officer of The Boston Global Forum, and Director of The Michael Dukakis Institute for Leadership and Innovation. Mr. Nguyen may be reached at Tuan_Nguyen@bostonglobalforum.org.